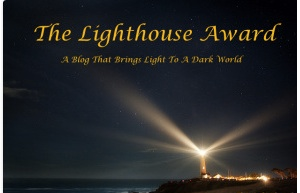 How very lovely gozzabear has nominated this blog for the Lighthouse award. Thank you so much. There is no limit to the number of people that you can nominate. I lead health walks at the weekend (after Parkrun – when I do it), the walks are designed to help people regain health after, illness, injury or inactivity. I like to listen to people and chat through their problems, hopefully helping them to see they are ‘fixable’ problems and not destructive. Sometimes the best help, is just to be there when needed, in whatever role the person needs you.